The invention provides a flyback type alternating-current and direct-current conversion device. The flyback type alternating-current and direct-current conversion device comprises a rectifying circuit, an electronic switch, a flyback type transformer and an auto charge pump circuit, wherein the flyback type transformer is provided with a primary side and a secondary side; the primary side is electrically connected with the rectifying circuit and the electronic switch; one side of the auto charge pump circuit is electrically connected with the secondary side of the flyback type transformer and the other side of the auto charge pump circuit is electrically connected with a load and is used for increasing the conversion efficiency of a power supply and inhibiting an output voltage ripple. Furthermore, the invention further discloses a power supply conversion method of the flyback type alternating-current and direct-current conversion device. 本发明是与电源转换有关；特别是指一种返驰式交直流转换装置及其转换方法。  The present invention is related to the power converter; particularly, to a flyback DC-AC conversion device and conversion method. 返驰式电能传输系统与一般接触型电能传输系统最大的不同，在于返驰式电能传输系统不须经由电力线直接传输能量，而是利用一返驰式变压器电磁耦合而将能量由一次侧传递至二次侧电路，然而返驰式变压器因其先天耦合不良因素，使得电力转换效率较低。  The fly-back power transfer system with a general-contact power transmission system, the biggest difference is that the flyback power transfer system is not subject to direct transmission from the power line energy, but using electromagnetic coupling a flyback transformer the energy from the primary side circuit to the secondary-side transfer, however, because of its inherent flyback transformer coupled adverse factors, such low power conversion efficiency. 因此，传统返驰式电能传输系统常利用共振式阻抗匹配方式，来提升电源转换效率，但是利用阻抗匹配电路方式实现的电路，甚易受返驰式变压器耦合系数参数影响，而达不到预期效果，造成电源转换效率低落。 Thus, the conventional flyback power transfer systems often utilize resonant impedance mode to improve power conversion efficiency, but the use of the circuit of the impedance matching circuit manner, very susceptible flyback transformer coupling coefficient parameters, while achieving the desired effect, resulting in low power conversion efficiency. 此外，由于电能传输系统的输出电压需大于负载电压，才能够克服输出端的电位而将能量传送至负载，因此返驰式电能传输电路中，往往需要较大匝数比的变压器才能够将电压提升至所需电压，如此一来，而返驰式变压器的铜损随着线圈匝数增加而增加，以致电源转换效率降低。  Further, since the output voltage of the power transmission system must be greater than the load voltage, to be able to overcome the potential of the output terminal and transferring energy to a load, so flyback power transmission circuit, often require larger transformer turns ratio to be able to to increase the voltage to the required voltage, this way, the flyback transformer copper loss increases as the number of turns increases, so that the power conversion efficiency decreases. 有鉴于此，本发明的目的用于提供一种返驰式交直流转换装置及其转换方法，可以提供负电位以补偿负载电压的阻障，进而可降低变压器的线圈匝数比，以降低铜损提升电源转换效率，使得变压器一次侧能量能够更平顺更有效率的传送至负载，进一步增进电源转换效率。  In view of this, an object of the present invention to provide an apparatus and a flyback type DC-AC conversion method, the barrier may be provided to compensate for the negative potential load voltage, and thus can reduce the turns ratio of the transformer, to reduce the copper loss to enhance the power conversion efficiency, so that the primary side of the transformer can be smoother and more efficient energy transfer to the load, to further enhance the power conversion efficiency. 缘以达成上述目的，本发明所提供返驰式交直流转换装置用以将交流电源的电能转换后，输出供予一负载；该返驰式交直流转换装置包含有一整流电路、一电子开关、一返驰式（Flyback)变压器以及一自动电荷抽放（auto charge pump)电路。  edge to achieve the above object, the present invention provides a flyback DC converter means after for the AC power conversion, the output donative a load; the flyback DC converter includes a rectifier circuit, a electronic switch, a flyback (flyback) and an automatic charge drainage transformer (auto charge pump) circuit. 其中，该整流电路与该交流电源连接，且用以接收该交流电源的电能后转换成直流电输出。 Wherein the rectifier circuit is connected to the AC power supply, and for receiving the electrical power of the AC power into DC power output. 该电子开关与该整流电路电性连接。 The electronic switch is connected electrically to the rectifier circuit. 该返驰式变压器具有一一次侧以及一二次侧，且该一次侧两端分别电性连接该整流电路以及该电子开关，而该二次侧具有一第一端以及一第二端。 The flyback transformer has a primary side and a secondary side, and both ends of the primary side are electrically connected to the rectifying circuit and the electronic switch, and the secondary side having a first end and a second end. 该自动电荷抽放（auto charge pump)电路，其一侧电性连接该返驰式变压器，另一侧电性连接该负载；该自动电荷抽放电路包含有一第一二极管，其正极连接该第二侧的第二端，其负极电性连接该第二侧的第一端；一第一电容，其一端连接该第一二极管的负极；一电感，其一端连接该第一电容的另一端，而另外一端则电性连接该第一二极管的负极；一第二电容，并联连接该负载，且其一端连接该第一电容与该电感，而另一端连接该第一二极管的正极与该第二侧的第二端。 The automatic charge Drainage (auto charge pump) circuit, which is electrically connected to one side of the flyback transformer, the other side electrically connected to the load; automatic charge of the drainage circuit comprises a first diode, whose anode is connected a second end of the second side of the negative electrode is electrically connected to the first end of the second side; a first capacitor having one end connected to the cathode of the first diode; an inductor, a first capacitor having one end connected to the the other end, while the other end is electrically connected to the cathode of the first diode; a second capacitor, connected in parallel to the load, and having one end connected to the first capacitor and the inductor, and the other end connected to the first two the second end of the positive electrode side of the second tube. D.导通该第一二极管，使该第一电容与该电感产生与前一步骤反向的电压，并对该第二电容充电，使该第二电容持续对该负载释能。  D. conduction of the first diode, such that the first capacitance generated in the previous step reverse voltage and the inductor, and charges the second capacitor, the second capacitor so that the load sustained release can. 由此，通过上述的设计，便可以在电源转换时，提供负电位以补偿负载电压的阻障，进而可降低该返驰式变压器的线圈匝数比，以降低铜损提升电源转换效率，使得该返驰式变压器一次侧能量能够更平顺更有效率的传送至负载，进一步增进电源转换效率。  Accordingly, by the above design, when the power converter can provide a negative potential barrier to compensate for the load voltage, which in turn may reduce the flyback transformer turns ratio, to reduce the copper loss to enhance the power conversion efficiency, so that the primary side of the flyback transformer can be smoother and more efficient energy transfer to the load, to further enhance the power conversion efficiency. 图6为第一电容的电压波型图。  FIG. 6 is a first capacitor voltage waveform of FIG. 该整流电路R与该交流电源100连接，且于本实施例中为一桥式整流器，用以接收该交流电源100的电能后，转换成直流电输出。  The rectifying circuit R connected to the AC power source 100, and in the present embodiment is a bridge rectifier for receiving the AC power after 100, into a direct current output. 当然，在实际实施上，除使用桥式整流器之外，亦可使用中间抽头式、真空管式、或是其它架构的整流器来达到相同的目的。 Of course, in a practical embodiment, except that the bridge rectifier outside the center-tap may also be used, vacuum tube, or other architectures rectifier to achieve the same purpose. 该电子开关SW与该整流电路R电性连接，用以受控制地导通或阻断该整流电路R 输出的直流电。  The electronic switch SW is connected to the electrically rectifying circuit R for the controlled conduction or blocking the direct current output from the rectifier circuit R.
 该返驰式变压器10具有一一次侧11以及一二次侧12。  The flyback transformer 10 having a primary side and a secondary side 11 12. 该一次侧11两端分别电性连接该整流电路R以及该电子开关SW，而该二次侧12具有一第一端121以及一第二端122。 The primary-side ends 11 are electrically connected to the rectifier circuit R, and the electronic switch SW, and the secondary side 12 has a first end 121 and a second end 122. 该第二二极管D2的正极连接该返驰式变压器10第二侧12的第一端121。  The second diode D2 is connected to the positive electrode of the flyback transformer 10 is a second side of the first end 121 12. 该第一二极管D1的正极连接该第二侧12的第二端122,其负极连接该第二二极管D2的负极，而通过该第二二极管D2电性连接至该第二侧12的第一端121。  The positive electrode of the first diode D1 is connected to the second end 122 of the second side 12, which is connected to the negative electrode of the second diode D2, connected to the second diode D2 via electrically the second end 121 of the first side 12. 该第一电容C1 一端连接至该第一二极管D1的负极、以及第二二极管D2的负极。  The first capacitor C1 has one end connected to the cathode of the first diode D1, a second diode D2 and the negative electrode. 该第三二极管D3的正极连接至该第一电容C1、第一二极管D1的负极以及第二二极管D2的负极。  The positive electrode of the third diode D3 is connected to the first capacitor C1, the second diode D2 and the cathode of the first diode D1 of the negative electrode. 该电感L的一端连接该第一电容Cl的另一端，另外一端则连接该第三二极管D2 的负极，而通过该第三二极管D3电性连接至该第一二极管D1的负极。 One end of L is  connected to the other end of the inductance of the first capacitor Cl, the other end of the anode of the third diode D2 is connected, is connected to the first diode through the third diode D3 is electrically negative diode D1. 该第二电容C2为非电解电容并联连接该负载200,且其一端连接该第一电容C1与该电感L，而另一端连接该第一二极管D1的正极与该第二侧12的第二端122。  The second capacitor C2 is connected in parallel to the non-electrolytic capacitor load 200, and having one end connected to the first capacitor C1 L and the inductor, while the other end is connected to the cathode of the first diode D1 and the second side 12, a second end 122. A.请参阅图2,导通该电子开关SW，使该整流电路R输出的直流电对该返驰式变压器10的一次侧11充电，而该电感L、该第一电容C1与该第二电容C2对该负载200释能。  A. Please refer to FIG. 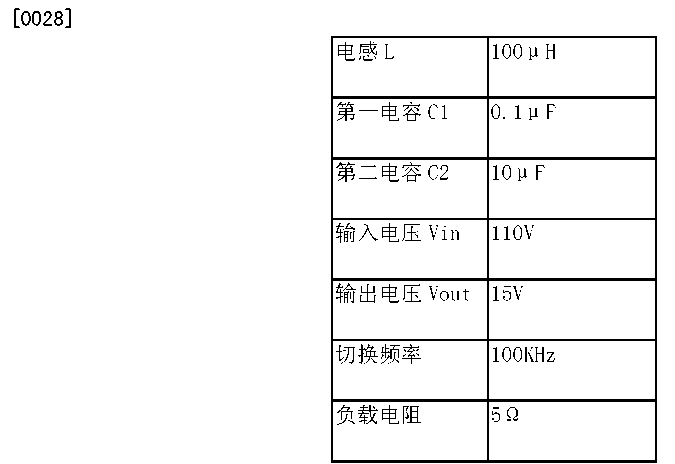 2, the electronic switch SW is turned on, so that the DC output from the rectifier circuit R to the primary side of the flyback transformer 10, 11 is charged, and the inductor L, the first capacitor C1 and the the second capacitor C2 is discharging to the load 200. B.请参阅图3,断开该电子开关SW，以阻断整流电路R的直流电，而使该返驰式变压器10的二次侧12对该电感L、该第一电容C1充电，并通过该第一电容C1与该电感L形成的共振电路，将其储能传导至该第二电容C2,以使该第二电容C2持续对该负载200释能。  B. Referring to FIG. 3, the electronic switch SW turned off, the rectifier circuit R for blocking direct current, the secondary side of the fly-back transformer 10, the inductance 12 L, the first capacitor C1 is charged and a first capacitor C1 through the resonant circuit formed by the inductance L, which is conducted to the second storage capacitor C2, the second capacitor C2 so that the sustained release can load 200. C.请参阅图4,当该返驰式变压器10停止释能，该第一电容C1与该电感L共振， 使该电感L的储能对该第一电容C1充能，而使该第一电容C1的跨压极性反转，此时，该第二电容C2依旧持续对该负载200释能。  C. Referring to FIG 4, when the flyback transformer 10 to stop discharging the first capacitor C1 and the resonance inductor L, so that the inductance L of the first energy storage capacitor C1 can be charged, the polarity of the voltage across the first capacitor C1 is inverted, this time, the second capacitor C2 to the load 200 still continue discharging. D.请参阅图5,当该电感的跨压L大于该第二电容C2的跨压时，进而导通该第一二极管D1，使该第一电容C1与该电感L产生与步骤C反向的电压，并对该第二电容C2充电，使该第二电容C2持续对该负载200释能。  D. Please refer to FIG. 5, when the voltage across the inductor L is greater than the voltage across the second capacitor C2, and thus conduction of the first diode D1, a C1 so that the first capacitor and the inductor L generates step C with reverse voltage, and the second capacitor C2 is charged, so that the second capacitor C2 continuously discharging the load 200. 每执行一次步骤A至步骤D后，则表示完成一次周期的作动。 After  Each time step A to step D, the actuation indicating completion of a cycle. 是以，在该返驰式交直流转换装置持续作动的情况下，于步骤D后，便继续重复执行步骤A至步骤D，直至该返驰式交直流转换装置停止作动。 Therefore, in the case where the AC-DC flyback converter continuously actuated, after procedure D, we continue to repeat steps A to procedure D, until the AC-DC flyback converter means stops actuating. 由此，通过上述的该自动电荷抽放电路20的设计，于每次作动周期中，该第一电容C1的跨压Vcl可如图6所示般自动地提供负电位，而导通该第一二极管D1，以使该第一二极管D1导通前后的整体电路结构改变，并通过负压补偿负载200上的电压所产生的阻障。  Accordingly, the above-described design of drainage of the automatic charge circuit 20 in each actuation cycle, the voltage across the first capacitor C1 Vcl as illustrated in FIG 6 can automatically provide a negative potential, and the first diode D1 is turned on, so that the overall structure of the circuit before and after the change of the first diode D1 is turned on, and the voltage on the load 200 of the barrier generated by the negative pressure compensation. 如此一来，便可降低该返驰式变压器10的线圈匝数比，进而降低铜损，且亦可使得该返驰式变压器10 -次侧的能量能够更平顺更有效率的传送至负载200,进一步增进电源转换效率，同时具有较低输出电压涟波的效果，进而达到提升该第二电容C2的使用寿命的效果。 In this way, it can reduce the number of coil turns than the fly-back transformer 10, thereby reducing the copper loss, and may also cause the flyback transformer 10 - times smoother energy side can be more efficiently delivered to the load 200 , to further enhance the power conversion efficiency, while having a lower output voltage ripple effects, and thus achieving the effect of lifting the second capacitor C2 of life. 另外，该第二二极管D2以及该第三二极管D3的设计更可有效地分别防止电路产生回流影响该返驰式变压器10、以及该自动电荷抽放电路20的作动，进而使得整体电路更加地稳定，以提升该返驰式交直流转换装置能源转换与抑制涟波的效果。  Further, the second diode D2 and the third diode D3 may be designed to more effectively prevent the recirculating circuit, respectively, of the flyback transformer 10, and automatically charge the drainage circuit of the actuator 20 , thus making the overall circuit more stably, to improve the AC-DC converter of the flyback energy conversion means and the effect of suppressing the ripple. 当然，在实际实施上，即使不使用该第二二极管D2以及该第三二极管D3仍可达到增进电源转换效率以及抑制涟波的目的。 Of course, in a practical embodiment, without using the second diode D2 and the third diode D3 enhance the power conversion efficiency can be attained, and the purpose of suppressing the ripple. 再者，以上所述仅为本发明较佳可行实施例而已，且在电气特性以及电路动作原理相同的情况下，前述各电路元件的设置位置以及数量、以及凡是应用本发明说明书及申请专利范围所为的等效电路变化，理应包含在本发明的权利要求范围内。  Further, the above description is only preferred possible embodiment of the invention only, and is at the same electrical characteristics, and the circuit operation principle, the installation position and the number of the circuit elements, and all applications of the present invention and description the equivalent circuit of the variation range of the patent, intended to be included within the scope of the claimed requirements of the present invention. 1. 一种返驰式交直流转换装置，用w将交流电源的电能转换后，输出供予一负载；该返驰式交直流转换装置包含有： 一整流电路，与该交流电源连接，且用W接收该交流电源的电能后转换成直流电输出； 一电子开关，与该整流电路电性连接； 一返驰式变压器，具有一一次侧W及一二次侧，且该一次侧两端分别电性连接该整流电路W及该电子开关，而该二次侧具有一第一端W及一第二端；W及一自动电荷抽放电路，其一侧电性连接该返驰式变压器，另一侧电性连接该负载；该自动电荷抽放电路包含有： 一第一二极管，其正极连接该第二侧的第二端，其负极电性连接该第二侧的第一端； 一第一电容，其一端连接该第一二极管的负极； 一电感，其一端连接该第一电容的另一端，而另外一端则电性连接该第一二极管的负极； 一第二电容，并联连接该负载，且其 1. The latter AC-DC flyback converter with the AC power w power converter, for outputting to a load; the AC-DC flyback converter comprising: a rectifier circuit connected to the AC power source, and by receiving the AC power converted into DC power W output; an electronic switch connected electrically to the rectifier circuit; a flyback transformer having a primary side and a secondary side W, and the primary-side ends are electrically connected to the rectifying circuit W, and the electronic switch, and the secondary side having a first end and a second end W; W, and an automatic drainage charge circuit, one side electrically connected to the flyback transformer , electrically connected to the other side of the load; automatic charge of the drainage circuit comprises: a first diode, its anode connected to a second terminal of the second side of the negative electrode is electrically connected to the second side of the first end; a first capacitor having one end connected to the cathode of the first diode; an inductor having one end connected to the other terminal of the first capacitor, the other end is electrically connected to the cathode of the first diode; a a second capacitor connected in parallel to the load, and which 一端连接该第一电容与该电感，而另一端连接该第一二极管的正极与该第二侧的第二端。 A first end connected to the capacitor and the inductor, and the other end connected to a second terminal of the first diode and the cathode of the second side. 2. 如权利要求1所述的返驰式交直流转换装置，其中该自动电荷抽放电路还包含有一第二二极管，一端连接该返驰式变压器第二侧的第一端，另一端连接该第一二极管的负极， 而使该第一二极管通过该第二二极管电性连接至该返驰式变压器第二侧的第一端。 As claimed in claim 1 said AC-DC flyback converter, wherein the circuit further comprises a drainage automatically charge a second diode, a first terminal end connected to the second side of the fly-back transformer, and the other end connected to the cathode of the first diode, the first diode is connected to the second side of the fly-back transformer through a first end of the second diode electrically. 3. 如权利要求2所述的返驰式交直流转换装置，其中该第二二极管的正极连接该返驰式变压器第二侧的第一端，而负极则连接该第一二极管的负极。 As claimed in claim 2, the AC-DC flyback converter, wherein the positive electrode of the second diode is connected to the second side of the fly-back transformer, a first end and a negative electrode of the first diode is connected negative. 4. 如权利要求1所述的返驰式交直流转换装置，其中该自动电荷抽放电路还包含有一第H二极管，一端连接该第一二极管的负极，另一端连接该电感，而使该电感通过该第H二极管电性连接至该第一二极管的负极。 4. A flyback according to claim 1 AC-DC conversion device, wherein the automatic drainage charge circuit further comprises a first diode H, the first end connected to the cathode of the diode, and the other end connected to the inductor, the the inductor is connected to the cathode of the first diode through the second diode is electrically H.
5. 如权利要求4所述的返驰式交直流转换装置，其中该第H二极管的正极连接该第一二极管的负极，而其负极连接该电感。 5. A flyback claimed in claim 4, wherein the AC-DC conversion means, wherein the positive electrode H of the diode is connected to a first diode cathode and its anode connected to the inductor. 6. -种如权利要求1所述的返驰式交直流转换装置的电源转换方法，包含有下列步骤： A. 导通该电子开关，使该整流电路输出的直流电对该返驰式变压器的一次侧充电，而该电感、该第一电容与该第二电容对该负载释能； B. 断开该电子开关W阻断该整流电路输出的直流电，使该返驰式变压器的二次侧对该电感、该第一电容与该第二电容充电，并使该第二电容持续对该负载释能； C. 该返驰式变压器停止释能，W使该电感的储能对该第一电容充能，而使该第一电容的跨压极性反转，且该第二电容对该负载释能； D. 导通该第一二极管，使该第一电容与该电感产生与前一步骤反向的电压，并对该第二电容充电，使该第二电容持续对该负载释能。 6. - The method of converting power AC-DC flyback converter of the kind as claimed in claim 1, comprising the following steps: A. the electronic switch is turned on, so that the DC output of the rectifier circuit of the flyback transformer charging the primary side, the inductor and the first capacitor and the second capacitor discharging to the load; B. OFF the electronic switch block W DC output of the rectifier circuit, the secondary side of the flyback transformer the inductor, the first capacitor and the second capacitor is charged, the second capacitor and the load sustained energy release; C. the flyback transformer to stop discharging, W the energy storage inductance to the first charged capacitors, the polarity of the voltage across the first capacitor is reversed, the second capacitor and discharging the load; D. conduction of the first diode, so that the first inductor and the capacitance generated a step before reverse voltage, and charge the second capacitor, the second capacitor so that the load sustained energy release. 7. 如权利要求6所述的电源转换方法，其中，于步骤D后，还包含有一步骤，是重复执行步骤A至步骤D。 7. A power conversion method according to claim 6, wherein, after procedure D, further comprising a step, a step of repeating steps A through D.
8. 如权利要求6所述的电源转换方法，其中，于步骤B中，该返驰式变压器的二次侧通过该第一电容与该电感形成的共振电路，将其储能传导至该第二电容。 8. The power conversion method according to claim 6, wherein, in step B, the flyback transformer through the secondary side of the resonant circuit formed by a first capacitor and the inductor, which is conducted to the first tank two capacitors. 9.如权利要求8所述的电源转换方法，其中，于步骤C中，该第一电容与该电感形成的共振电路后，该电感的储能对该第一电容充能，而使该第一电容的跨压极性反转，且当该电感的跨压大于该第二电容的跨压时，该第一二极管导通，而进入步骤D。 9. A power conversion method as claimed in claim 8, wherein, in step C, after the first capacitor and the resonant circuit formed by an inductance of the first capacitor charging energy storage, so that the first a polarity of voltage across the capacitor is reversed, and when the voltage across the inductor is greater than the voltage across the second capacitor, the first diode is turned on, and proceeds to step D.